This year’s Giro Rosa course has a bit of everything from flat and fast sprinter stages to high mountain climbs and even a 21.9-kilometer time trial. 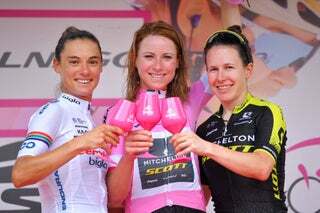 The Giro Rosa kicks off Friday, the most important stage race of the year for the Women’s WorldTour. This year’s course has a bit of everything from flat and fast sprinter stages to high mountain climbs and even a 21.9-kilometer time trial to keep things interesting. Anna van der Breggen returns to defend her title as last year’s Giro Rosa winner. She has a strong Rabo-Liv team behind her and will benefit from a flatter course this year. Stage 7’s individual time trial will also favor this strong rider who sealed the deal last year in the TT. But with Rabo-Liv’s Katarzyna Niewiadoma showing serious climbing form, she could be a good back-up if van der Breggen falters. 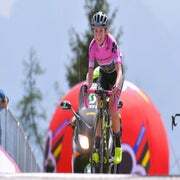 Climbing phenom Mara Abbott is hungry for a third Giro Rosa victory. She was just named to the U.S. Olympic team and will be throwing punches on the two big mountain stages of the tour this year. While not known for her time trialing, this featherweight racer has proven herself against the clock when it comes after a couple hard days of racing, as she did at this year’s Tour of the Gila. Megan Guarnier is currently leading the Women’s WorldTour and is eager keep her winning streak alive in Italy this week. She spent most of last year’s race in pink but was ousted in the time trial by van der Breggen. Guarnier will have the strongest team to support her and with world champ Lizzie Armitstead and Evie Stevens in the mix, Boels – Dolmans will be hard to beat. Don’t count out Emma Pooley either. She’s taken second at the Giro Rosa twice before and just signed onto the Lotto – Soudal Ladies team as she makes her comeback for the Rio Olympics. Pooley is world-class in the time trial as well as when it comes to climbing, so this could be the perfect course for the pint-sized racer. The tour starts with short and pancake-flat prologue in Gaiarine, Italy. A few precious seconds could be won and lost with the top contenders but this is really just to sort out who will wear what jerseys as we head into the first stage of the Giro Rosa. With the first real day of racing, the peloton will navigate 104 kilometers of mostly flat and rolling terrain. It’s a day for the sprinters with a flat, fast run-in to the finish line. Another flat and rolling stage, this longer, 111-kilometer stage ends with a short uphill ramp into the finish. The sprinters should still take the day, and those who thrive on difficult finishes will have the advantage here. In the longest stage of the race this year, the women face yet another flat course. But with the high mountains quickly approaching, nerves will be high and the peloton could get sketchy. Staying out of trouble will be the priority for anyone hoping to stand on the podium at the end of the race. Riders will get a scenic view of Lake Iseo as they navigate the entire shoreline during stage 4. Lush green mountains surround this pristine lake and those high peaks will be calling the GC riders’ names. 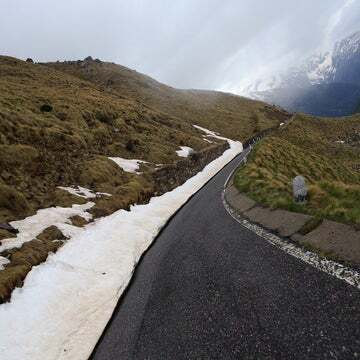 Finally, the climbers will have their day with this 77.5-kilmoter stage. There is only one real climb for the day, up the Mortirolo but it’s about 10 kilometers long and tops out at 1,800 meters. After a rolling 15 kilometers at this altitude, the course drops riders down a long descent into the finish. It probably won’t be the make-or-break day for the climbers but it should whittle things down to a select few. The queen stage of this year’s Giro Rosa starts in Androa and travels up four classified climbs, finishing on the steeps of the Madonna della Guardia. This is the last chance for the climbers to make their mark before heading into the remaining flat and time trial stages. The short and sweet individual time trial should solidify the race’s GC podium before heading into two more flat stages. The 21.9-kilometer race against the clock looks mostly flat but with some tricky twists and turns. It’s back to the sprinters for stage 8 with a flat and fast course. There will be some tired legs in the peloton but the finish will be exciting with one last big group sprint. The final day of the Giro Rosa throws one last climb into the mix in case the GC race is close and needs one final kick to the finish. The champion will be crowned and the final maglia rosa will be awarded.